once you do this, it will ask you for your password, enter that in. If you get an error, you may need to make your user account an admin account. it should download and then install the packages necessary for this utility/tool. 3. You will be prompted to choose which NTFS drives to edit. I only have my internal NTFS partition showing so I chose that. You will only get two options; to enable write options for internal and external NTFS drives. Pick what options you want and hit OK.
4. Hopefully you will now be able to access your NTFS drives and even write to them (if you choose such options). 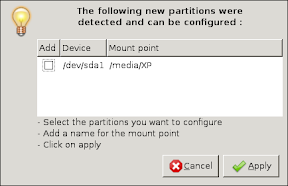 This is handy for those multi-booting Ubuntu/XP users.